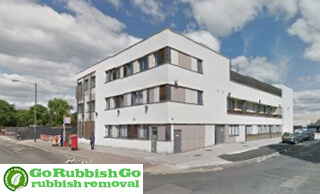 At Go Rubbish Go we have a range of rubbish disposal services available to hire in the surrounding of SE2 area. Whether you’re a business looking for a cost-effective way to reduce office clutter, or you own a residential property and need a load of junk to be taken away, you’ll find the perfect solution when you get in touch with our rubbish removal Abbey Wood company. Our workforce consists of dedicated professionals, all of whom have years of experience working in the rubbish removal industry in London. Call today on 020 8610 9182 to speak to one of our experts. Book a service and your job will be in safe and capable hands. 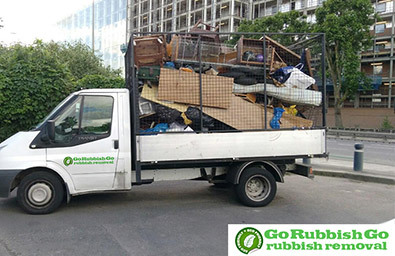 At Go Rubbish Go we’ve implemented a price plan – a price plan that should mean our rubbish removal services are available and accessible – from a financial standpoint – to anyone in the area in need of SE2 waste clearance. Unlike many other Abbey Wood rubbish disposal companies– and the entire waste removal industry for that matter – we don’t believe in charging extortionate prices for our services, services that are meant to help. We want our services to be a cheaper alternative to skip hire, not on par in terms of pricing. To get a free estimate for your waste disposal job, contact us today on 020 8610 9182 and make use of our low prices. We believe we’re far superior to other waste collection SE2 companies in because we know what our customers seek when they hire Abbey Wood waste collection services. We have industry experts on board, individuals who possess a wealth of experience when it comes to rubbish disposal, making us highly adept when it comes to handling any waste removal job in the local area. We also listen to our customers’ feedback, enabling us to adapt and learn, and to make the process run even more smoothly. All of this makes for a top-notch service, and when combined with our low prices, it definitely makes our services the best around. Perfect and exactly what I wanted! The waste clearance service I hired was cheap, professional and they cleared out my spare room in Abbey Wood SE2 in no time at all. I couldn’t have asked for anything more, or anything better! With our waste collection Abbey Wood, SE2 available to hire in the local area, you won’t have to put up with unwanted rubbish any longer than you need to. Gone are the days where you’d have to wait for a skip to come and have that unsightly load parked outside your property for days on end. Gone are the days when you’d have to book a rubbish removal service well in advance and cross your fingers to hope it all goes according to plan. With us it can all be carried out then and there, on the very same day if that’s what you want. So book today and you can be waving goodbye to your rubbish just hours later! We run our company like a well-oiled machine, so everything is carried out exactly as planned and there are no unexpected surprises for our customers. The only surprise you might receive is just how quick we work and how professional our waste disposal team are when delivering our services – but we’re sure that’s one surprise you won’t mind receiving. 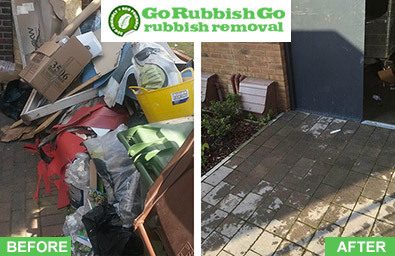 Book our rubbish removal in SE2, Abbey Wood and you’ll see that everything will run like clockwork – we’ll be in and out of your property before you even know it, leaving you with a rubbish-free household. For a free consultation with one of our expert members of staff, call today on 020 8610 9182! Abbey Wood lies within the London Boroughs of Greenwich and Bexley, in south east London. The district gets its name from the nearby Lesnes Abbey Woods – an area of ancient woodland and a nature reserve. The Victorian Crossness Pumping Station is also a place to visit when in the area – a masterpiece of Victorian engineering. Abbey Wood is a built up area but also has a number of parks, open spaces and recreational facilities. Bostall Heath and Bostall Gardens have a number of sport pitches and facilities, as does Abbey Wood Park which is also in the vicinity. Abbey Wood railway station is the only station serving the suburb and provides National Rail services.